When my class time is up but I haven’t finished everything I wanted to. When I’m planning a 16-week class and there’s just not enough time. When I thought I could finish a draft of a paper in one afternoon but I didn’t even get close. or find that they are about to graduate before they had a chance to accomplish all their goals. I propose that we look to the rich literature on the psychology of time in the same way that we have looked to the science of learning for more effective studying and teaching methods. I will describe one example to illustrate what I mean, but there is much more out there. If only we had time to explore it all! Kahneman and Tversky (1979) defined the planning fallacy as a tendency to underestimate how much time we need to complete larger tasks and overestimate the time we need for smaller tasks. We tend to be confident in these estimates – confident, but wrong (Buehler, Griffin, & Peetz, 2010). Think about how this affects your plans for a large project like your thesis or dissertation. Also think about how your students might struggle with finishing a project on time, or why they might run out of time and submit work that is less than their best. Fortunately, there is research on how to estimate more accurately how much time it will take to do something. One strategy is to avoid anchoring effects, in this case anchoring on the present when making a time estimate. LeBouef and Shafir (2009) found that people could make better estimates if they identified a future date at which they thought they would finish instead of estimating how many days from now. Another way to make more accurate time forecasts is to consider how much time similar tasks took in the past (König, Wirz, Thomas, & Weidmann, 2015). It also helps to think about possible obstacles that can cause delays (Buehler et al., 2010). When your student is estimating that she can knock out that paper in three hours, she may not be considering possible interruptions, technology issues, or finding out that the key article she needs is not available full-text. Imagining from the perspective of an observer can also improve accuracy (Buehler et al., 2010). What would your friend say about your plan to complete the literature review of your dissertation in one week? We might ask whether making better time estimates is that important. It doesn’t speed anything up or save time, right? But if our estimates are inaccurate, we will make mistakes in budgeting our time. Other things may fall through the cracks – sleep, for example – which could affect our well-being and success. One way to improve our relationship with time is to get a better handle on how much time we need. The research suggests that we can get better at it. At the upcoming APS-STP Teaching Institute, I will share a few other examples of how we can make use of the literature on the psychology of time. I hope to see you there …. if you can find the time! Kahneman, D., & Tversky, A. (1979). Intuitive prediction: Biases and corrective procedures. TIMS Studies in Management Science, 12, 313-327. David S. Kreiner is Professor and Chair of the School of Nutrition, Kinesiology, and Psychological Science at the University of Central Missouri, where he has taught since 1990. He earned his B.A. in Psychology and Ph.D. in Human Experimental Psychology from the University of Texas at Austin. He has taught courses including General Psychology, Orientation to Psychology, Research Design & Analysis I & II, History of Psychology, Advanced Statistics, Cognitive Psychology, and Sensation & Perception. His research interests include language processing, memory, and the teaching of psychology. He often collaborates with students on research projects and has coauthored publications and conference presentations with undergraduate and graduate students. As an undergraduate student, I learned that being primed with the stereotype of professor could make me act smarter, that I might deplete my self-control if I refused the tempting cookies presented to me at a meeting, and that if I conducted a study whose findings were unexpected, I could just rewrite my introduction and tell a new story. Thankfully, I also learned how to learn, which prevented me from becoming trapped in a knowledge time warp. Psychological “facts” have an estimated half-life of seven years (Arbesman, 2013). Seven! This means that by the time you have completed graduate school, half of the psychological findings you learned as an undergraduate will have been updated, revised, or deemed outright wrong. Such is the nature of scientific progress. However, this helps drive home the point that one of our most important goals as teachers is to help our students develop into lifelong learners who will be able to continue learning (effectively and across a range of topics) long after they have left our classrooms. The term learning how to learn comes from Fink’s taxonomy of significant learning (2013), which includes six major categories: foundational knowledge, application, integration, human dimension, caring, and learning how to learn. If you are not familiar with Fink’s model, I highly recommend checking it out (see recommended reading below). Learning how to learn takes a number of different forms, and in each of the courses I teach, at least one of these forms is emphasized. The first form is learning how to be a better student, the second form is learning how to construct new knowledge in a discipline, and the third form involves helping students become “self-directing learners” (Fink, 2013, p. 59), the key to which involves the ability to critically reflect on one’s own learning. Below I provide some examples of how I encourage these various forms of learning how to learn in different courses that I teach. Without a doubt, this form of learning how to learn gets emphasized the most in my Introductory Psychology class. In order to encourage my students to adopt better learning strategies, I don’t just teach them what psychologists have learned about effective study strategies (see links to helpful resources from the Learning Scientists below). Instead, I first let the students tell me (via a survey or in-class response system) how they typically study, and then I frame the lesson around their responses. Specifically, I address the limitations of their common habits (e.g., cramming) and study strategies (e.g., re-reading), explain why these strategies seem appealing despite their limitations, and then provide the students with more effective replacement strategies (e.g., retrieval practice), including an overview of the research that has been done on each strategy and specific tips for how to implement these strategies in Intro Psych. Rather than presenting this information a preachy way (“everything you are doing is wrong and I know better!”), I want the students to recognize that they are not alone in using these common strategies, and that I completely understand why they use them, but that I have good reason to believe they can learn even more effectively by adopting some new strategies. In a similar vein, I also present students with research on the effects of technology use on learning (both in the classroom and when they are studying on their own). Again, I ultimately leave it up to the students (as self-directing learners!) to make their own decisions, but I arm them with the information that will allow them to make informed decisions about whether they take notes with a laptop or on paper, where they should leave their phone during class or a study session, and so on. A detailed slide-deck that can be used for covering this material in your own classes is available via a link below. We all know that students should practice writing and get hands-on experience doing research as much as possible. Encouraging this form of learning how to learn is standard in any research methods or laboratory class. But it’s worth spending a moment to reflect on the type of inquiry and knowledge construction students are engaging in across all of your courses. Are they being pushed enough? Are they being asked to truly write and think “like a [social/cognitive/clinical etc.] psychologist,” or are they simply getting practice using some new terms and theories? As an example, students in my Intro to Social Psychology course used to complete an assignment where they analyzed an event from a social psychological perspective. It was a perfectly good assignment, but what were the students actually learning? Application is important, don't get me wrong (it has its own category in Fink’s model), but I have since replaced this assignment with an observational study project where the students must develop a hypothesis; design a study; collect, analyze, and interpret their data; and write everything up in a final APA-style report. This new assignment obviously requires a lot more scaffolding and resources, but the students walk away from the course not just being able to apply the knowledge they’ve learned, but with the ability to potentially contribute to that knowledge base. Additionally, they are in a better position to recognize the limitations of drawing conclusions from single studies and the importance of replication and reproducibility. Most of what our students do, they do because we tell them to. For example, students in my Social Psychology Laboratory class complete a research proposal because that is what they are told to do. They develop their own research question and hypothesis and design their own experiment, which all seems perfectly “self-directed.” However, the task falls short of its goal if the students fail to engage in a critical reflection of their learning throughout this process. The way that I encourage this (in this class and others) is through the use of reflective learning journals. Reflection changes everything. When students are encouraged to reflect on their learning it can improve their self-monitoring and goal-setting capabilities as well as lead to changes in study habits and other skills. It encourages students to focus more on the how and why of their learning, rather than simply on what they are learning. Students who are able to critically reflect on their learning are much more likely to develop into self-directing learners, so I do whatever I can to give my students practice with reflection. More information on how I have implemented reflective learning journals into my statistics course can be found in the Waggoner Denton (2018) article listed below. Self-directing learners are able to recognize gaps in their understanding and formulate plans for filling those gaps. As a developing teacher, you are likely to start noticing all sorts of gaps in your knowledge and skills (all those things that manage to go unnoticed until we actually have to explain it to someone!). The next time you go about filling in one of those gaps, take some time at the end to reflect on the process you just undertook. Who did you talk to? What did you read? Could you have done it better or more efficiently? And how did you know how to do these things? Would your students know what to do? Below are some resources that may be useful as you consider how to incorporate certain aspects of learning how to learn more fully within your own courses! Arbesman, S. (2013). The half-life of facts. New York: Penguin. Fink, D.L. (2013). Creating significant learning experiences: An integrated approach to designing college courses. San Francisco: Jossey-Bass. Ashley Waggoner Denton is an Associate Professor, Teaching Stream in the Department of Psychology at the University of Toronto. She received her Ph.D. in Social Psychology from Indiana University and completed her bachelor's degree at the University of Toronto. She teaches courses including Introductory Psychology, Social Psychology, Statistics, and the Social Psychology Laboratory. She also supervises undergraduate research projects that examine questions related to the social psychology of teaching and learning. This past October, I had the privilege of volunteering for and presenting at the 9th Annual Pedagogy Day held at the Graduate Center CUNY and organized by members of the GSTA. At first I was concerned; would my non-psychology-focused presentation go over well at a conference hosted by the Psych department? The conference was open to anyone, but as a music educator would I benefit from the presentations? As the proceedings began, it was immediately evident that my concerns were for naught; from the start I could see that this was a conference of great benefit to anyone interested not only in psychology but also in higher education pedagogy in general. I truly feel as if I learned something useful from every presentation I attended. In particular, I loved the message of keynote speaker Sue Frantz (click here to see a recording of the keynote address), who challenged the audience, when preparing to teach an Intro Psych course for undergraduates, to consider what their real-life neighbors might need to know about psychology. Though the topic at hand was purely psychology, I found the question to be relevant to any course taught to students who are not planning to major in a particular subject. When teaching an introductory course, it is important for educators to remember that the students enrolled will someday be our neighbors –construction workers, educators, dentists, pilots – so what do they need to know about the subject being taught? My contribution to Pedagogy Day was a bit different than Sue Frantz’s. Rather than challenge the audience to think about what non-majors might need to know, I challenged them to think more creatively about the collection and retrieval of information, particularly to encourage/improve research and critical thinking skills. 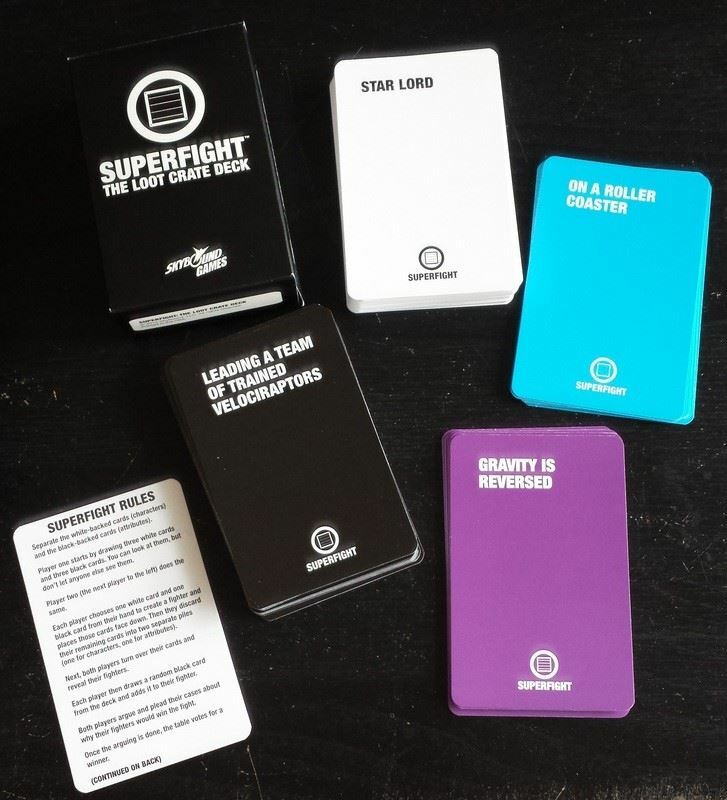 I shared information on a mod – a modification of a pre-existing game – called Superfight by Jack Dire. In the original version of this self-described “game of absurd arguments,” players draw three each of two kinds of cards: Characters and Attributes. For instance, a player may have a hand containing three characters – Abraham Lincoln, Superman, and Godzilla – and three attributes – the ability to shrink in size, a water gun, and a beard full of bees. Each player then chooses a character and an attribute from their hand and “battles” through debate against another player to determine who would emerge victorious in a fight. A third player judges the debate and decides who wins. My version, called Music Melee, takes this debate concept and the accompanying game mechanic of randomization and applies it to music history. 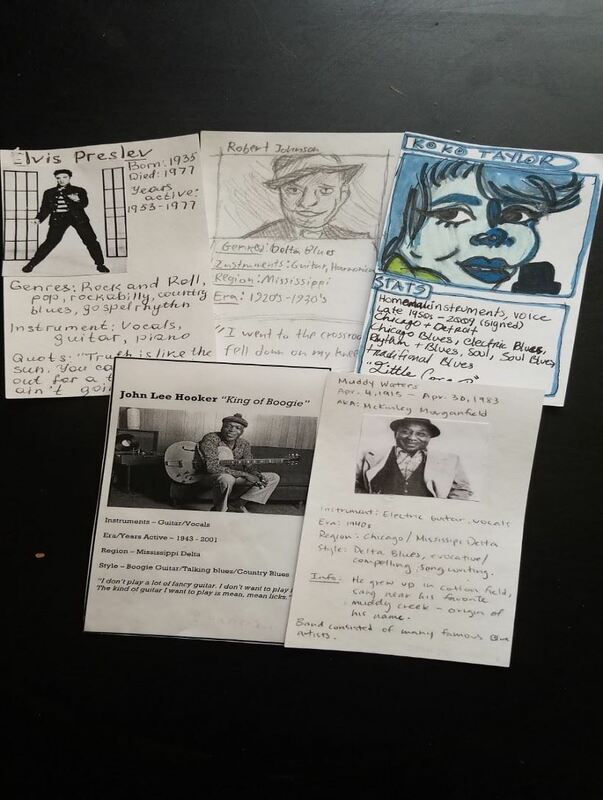 In the basic version, character cards contain information about a significant musician we’ve studied in class, and attribute cards are instruments. Students form groups of three (two to actively debate, one to judge), choose an artist and instrument from their hand, and make an argument for why their choice would outperform their opponent in a battle of the bands. To make the game run smoothly in my 50-student class, after each of the initial three players in a group has battled each other (creating a “best two out of three” scenario) the two losing players join the winner as support, resulting in a new team of three. This pod of three then finds two other pods to debate (with a larger arsenal of characters to choose from now) and again, the two losing pods join the winner, creating teams of nine. This continues until there are three massive teams debating in the room. At this time, for the final round, only the team champion (the single person on the team who has yet to lose any debate) can speak for their team in a live debate in front of the class. Students create the cards. In the week(s) leading up to the game, each student must choose a couple of artists to research. Thus, the students themselves create the playing deck, requiring very little preparation from the instructor. I give the students a number of specific points they must include on their cards, treating each as a small research project, but another professor might adjust this in a different way. It encourages not only information retrieval, but also critical thinking. Often, the instrument/musician pairings are not ideal; the best combo a student might produce from their randomized hand might be, for instance, Umm Kuthum with a didgeridoo. In this situation, students must get creative in their arguments, not only recalling information learned in class but also considering what factors might create a persuasive argument (in this example, a student might argue that because Umm Kulthum is considered such an important vocalist in Egypt and the broader Middle East, she may have the lung power to master a didgeridoo better than say, Jimi Hendrix, who did not play any aerophone instruments). Students learn what does or does not make a strong argument, which can later be applied to research papers. In my class, we spend time before the game having a full class discussion to determine what does or does not make a strong argument. We create a sort of rubric on the board, which students can then refer to when making or judging an argument during gameplay. The game can be easily modified to up the ante. For instance, you may add in random situations/scenarios mid-debate: Suddenly the musicians are performing in 18th century Venice or can only perform acoustically; how does this affect the argument being made? Likewise, the game can be modified to teach a number of different subjects. At Pedagogy Day I asked the audience for ideas, and a number of instructors mentioned the idea of creating a deck of psychologists as the character cards, with various research variables/items (B.F. Skinner’s rats could be a card, for instance) as the attributes. My interest in games as a tool for learning has led me to become involved in the CUNY Games Network. As part of the steering committee for the CUNY Games Network, I firmly believe that game-based learning is a useful method for teaching any subject in higher education. Music Melee is a simple game, but whenever I introduce it in class the students latch on; I am always surprised when students who have been quiet all semester suddenly come alive during their debates. This is just one example of game-based learning (GBL) and “modding.” To learn more, I highly encourage anyone interested to take advantage of the plethora of resources and fellow pedagogues interested in GBL in higher education here at CUNY. 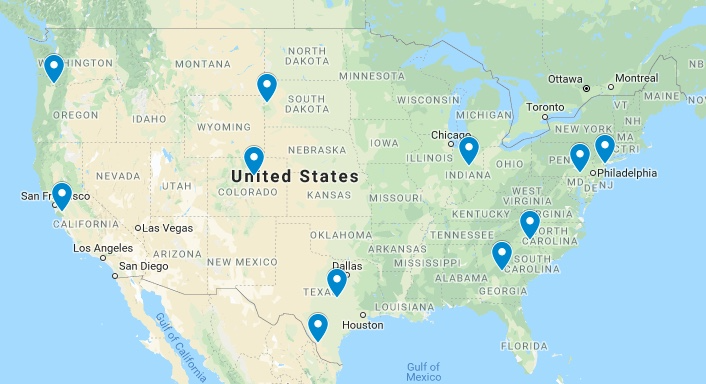 The CUNY Games Network is open to anyone (CUNY or non-CUNY, as long as your interest is GBL in higher education), and we welcome those with previous GBL experience as well as those just starting out. To sign up for the mailing list and read more about games in the classroom, visit cunygames.org. There, you will also find information about the upcoming CUNY Games Conference 5.0, which will be held January 18, 2019 at Borough of Manhattan Community College (click “Events” to find the conference info.). Carolyn Stallard is an Ethnomusicology student and Senior Teaching Fellow at the Graduate Center and an adjunct instructor at Brooklyn College. She is a member of the steering committee for the CUNY Games Network and researches game-based learning in higher education. Choosing the right materials to support your course is one of the most important decisions an instructor must make. Whether you choose your own materials independently, serve on a textbook decision committee, or administer a course for which materials are chosen for you, this decision will have significant implications for the quality of the course experience for you and your students. Today’s instructors face a bewildering array of choices, which has both an upside and a downside. On the positive side, having many choices is always a good thing, as courseware can be tailored to a specific group of students with characteristics best understood by their professor. On the downside, reviewing the many available materials represents a significant commitment in instructors’ time, which is already in very short supply. The point of this article, then, is to help instructors focus on some of the key variables involved in courseware decisions. In the interest of transparency, I am actively authoring two traditional textbooks for Cengage as well as serving as lead author for a lower-cost electronic textbook for TopHat. I have also worked with the APS Wikipedia Initiative and even sat on a panel for APA on “Teaching Without Textbooks.” While I fully appreciate the success of open source software, the typical model for open education resources (OER), I am also willing to pay for outstanding proprietary products like those from Adobe. The point is to obtain the tools that best fit your needs. Each type of courseware has its own set of strengths and weaknesses. By examining these, we can begin to identify areas where the materials differ. The traditional textbook provides the complete package. Not only do you get a heavily peer-reviewed document, which minimizes errors, but publishers generally provide testbanks, instructors’ manuals (e.g., lecture notes, activities, lists of TED talks and videos), online homework and enrichment activities, and PowerPoints. This option is literally “Doc in a Box.” The textbooks are also updated at regular intervals. This might not be essential in algebra, but it’s a must in sciences like psychology. On the negative side is the elephant in the room—cost. Many people do not know why the costs of traditional textbooks are high, which contributes to the mentally lazy vilification of traditional publishers as “evil corporations.” The actual printing cost of a book is relatively little. Most of the cost represents work by a fairly large group of people, not just the authors. We have development editors who help shape our content, copyeditors, photo researchers, indexers, and sales teams. Hundreds of paid peer reviewers scour our work for errors. Still others produce the testbanks and other ancillaries, which are also reviewed. The publisher must ensure that online materials present a positive user experience, leading to an ever-increasing need for expensive IT people and equipment. Traditional publishers are held to a very high standard of accessibility and ADA compliance, which is also expensive. Publishers of both textbooks and books for the general public face these same challenges. What makes life much harder for textbook publishers is the impact of the used book and rental markets. Who sells or rents their copy of Harry Potter? Sacrilege! The relatively tiny printing cost is the only variable that depends on the number of books produced. The remaining costs that I mention must be paid regardless of how many books are sold. If you spread these costs over single payers (each reader of Harry Potter or an assigned textbook), traditional textbooks would be as affordable as Harry. This doesn’t happen, of course, as the vast majority of students assigned a textbook will purchase used or rental copies. In spite of “don’t sell” notices adorning instructors’ desk copies, some instructors sell them anyway for extra spending money. Amazon affiliates and the campus bookstores are the main recipients of this largesse. They pay the student very little at buyback, store the book on the shelf for a few days, then sell it again at nearly new prices. None of this money, of course, goes back to the publisher to offset any production costs. What makes the traditional textbook expensive is the fact that new book sales represent a relatively small fraction of overall users. Image : The upper graph demonstrates the effects of the used book market on publisher sales and the lower graph demonstrates the effects of both the rental and used book market over the six semester lifespan of a textbook (Benson-Armer, Sarakatsannis, & Wee, 2014). Publishers only recoup production costs from new sales, not total use of their intellectual property. 1 = Assumes percentage of students who do not acquire textbooks shifts from 20% to 8% due to introduction of the rental market (which reaches 30% penetration). Just as the music industry did to avoid the hemorrhage that was Napster, publishers have moved to electronic versions of textbooks, or the iTunes model. The advantage to the publisher is not due to lower printing costs, which are quite small anyway, but rather to the spreading of production costs across more users because resale is limited. Electronic books are typically half or less of the cost of the print version and will go lower as adoption of electronic books increases. Incidentally, the idea that students learn better from print than electronic books appears to be a myth, at least according to careful research presented by Regan Gurung (2017). For students who insist on something they can hold in their hands, publishers make loose-leaf versions available for a few extra dollars over the electronic book cost. Electronic materials have another advantage. Many students do not buy their assigned text. When instructors use electronic books and their associated homework, they know exactly who does and does not purchase a textbook. The analytics associated with the electronic books even show you how much time each student spends with the materials, which can be very helpful when advising a student doing poorly in your class. We still don’t know how well the revolutionary Cengage Unlimited model is going to work. This model (nicknamed the Netflix model) allows students access to ALL Cengage titles while paying a slightly higher fee than they would for a single electronic title. Students rarely pay attention to the publishers of their assigned textbooks, but this model might make them more sensitive to that. If successful, we can anticipate all of the major publishers will begin offering this service. Before jumping to conclusions that students ALWAYS want low-cost or free textbooks, consider the following. Many of the lowest income students are receiving federal grants that include the purchase price of new textbooks. Washington surely doesn’t want the textbooks back at the end of the term, so the student is free to sell the books. This provides a significant income for these students, who object strenuously to OER or electronic books with no resale value. Affluent students often follow a similar strategy. Their parents pay for books but do not consider their resale value, so the student gets a bit more discretionary income without having to ask for it. A final key aspect of the decision to use a traditional textbook is whether the instructor actually needs a textbook. If you provide students with comprehensive study guides and PowerPoints, and assess exclusively on that content, it should come as no surprise that students either do not purchase the text or complain about having to purchase the text. Texts are only valuable if they are used. All of us receive frequent emails from indie textbook publishers, both print and electronic, that promise a less expensive option of perhaps $40 or so. These options vary substantially in quality and in the support provided for the instructor. My all-electronic TopHat project probably represents the higher end of this classification in terms of quality. We have very capable development editors and were supported by a copy editor and graphics designer. Costs are cut by using photos that were open source. Photo permissions for traditional textbooks can be very pricey. I actually purchased the “blue/black or gold/white” illusion dress from eBay and wore it for a photo for my Cengage books (and yes, I can attest to the fact that it really is blue and black) when the difficulties of obtaining permission to use the original photo were insurmountable. Another cost savings was the relatively sparse pre-publication review. We had one person per chapter review our work prior to publishing compared to hundreds in traditional text publishing, which I must say made me nervous. TopHat assumes that crowdsourcing will fix problems after publication, a point of view shared by many open educational resource (OER) advocates. 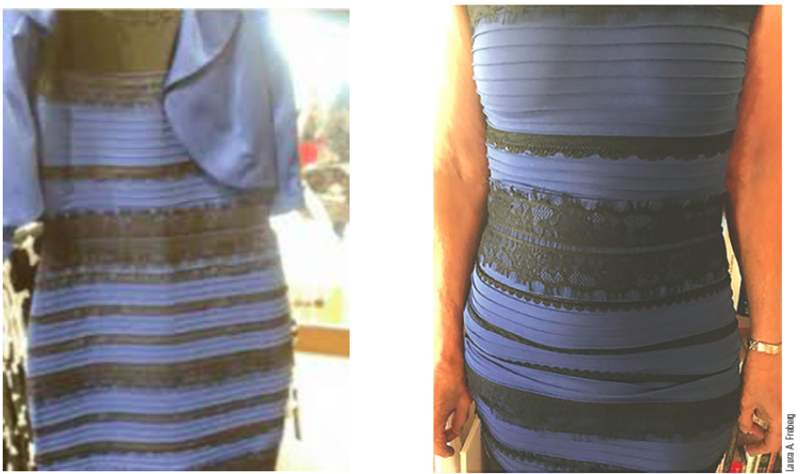 Image 1 Caption: To save money, I actually purchased a version of the blue/black/white/gold dress on eBay so we could include a photo in my textbooks. The original photo is on the left and I am wearing the dress on the right. My husband, armed with his cell phone camera, and I walked around the house until we found lighting that allowed us to duplicate the illusion. In spite of these cost savings, TopHat charges $61 for our book as opposed to the $95 cost of the basic Cengage electronic books. So even when you do not have to worry about the effects of used and rental textbooks on your sales, there is an underlying truth about the costs of producing quality materials – it can only go so low. The largest advantage of OER is cost to the student. Who doesn’t like free stuff? Having paid for my own college education, I am not unsympathetic to this. Instructors can endear themselves to their students and administrations by using OER, resulting in higher evaluations. Their classes get special recognition in the registration process, in a not-so-subtle public shaming of instructors who prefer traditional or low-cost materials. Note that OER is not “free” at the institutional level. Colleges and universities spend considerable resources on grants and support personnel for OER that reduce support for other functions. OER advocates tell me that cost is not the only advantage. You can bring in a multitude of materials in addition to a free text and instructors can adapt the material to fit their needs. I agree, but there’s nothing stopping you from doing these things WITH the electronic versions of traditional texts, which have the capability of embedding videos, assessments, activities, and documents seamlessly. In many cases, the publishing company staff will set up the course the way the instructor wants it. On the downside, if traditional textbooks are “Doc in a Box,” OER materials are stone soup. It might be possible to simply use materials as-is, but I know very few people who do that. Some people enjoy the revising and curating process, but others simply can’t fit additional course prep time into a heavy research and service load. Additionally, instructors might not have the necessary skillset for these tasks. Being a great teacher and researcher does not automatically make you a courseware expert. Continuity and updating of OER materials by entities such as OpenStax is somewhat vague. Foundation money might provide for original production costs, but who has ownership of the ongoing health of these materials? As mentioned previously, OER materials, unlike traditional text materials, are rarely assessed for ADA compliance. You don’t have to look at too many materials before finding some with blinding areas of inaccessibility. Bringing materials into compliance is expensive and time-consuming, and lawsuits are even more so. Until now, OER materials have been given a “pass” not enjoyed by traditional publishers, but that is not likely to last forever. In 2017, Regan Gurung undertook direct comparisons between OER materials in introductory psychology (NOBA) and three traditional textbooks (Hockenbury & Hockenbury, Cacioppo & Freberg, and Myers & DeWall). You might have heard of numerous studies that show that students using OER have the same level of achievement as students using traditional textbooks, but Gurung carefully points out and controls for the design flaws in those efforts. He concluded that traditional textbook “users enjoyed their classes less and reported learning less than OER users but still scored higher on the quizzes.” In other words, just because students seem happier with OER does not mean they are learning more. OER are usually presented on campus as a positive contributor to social justice. This claim might be tempered if in fact student outcomes are superior with traditional materials. If less affluent, less-prepared students are more likely to be offered materials that result in lower performance, this is actually working in the opposite direction of true equity. As anyone teaching heuristics knows, the human decision-making system is subject to flaws. We can possibly avoid some of those flaws by thinking more systematically. One such approach is a utility model, where we assign ratings and weights to variables of interest and let the math point us in the right direction. If you’d like to try that out, I’ve provided a model you can use or adapt to your own needs. Begin by considering each “Feature” and assigning it a “Weight,” with “5” being “very important” and “1” being “not important at all.” Next, examine your sample materials, and assign each a “Rating,” with “5” being “very good” and “1” being “not very good.” Then, all you have to do is multiply Weight by Rating and sum the results. Ideally, this should give you an idea about which type of materials is likely to bring you the greatest level of satisfaction. No one type of courseware is likely to meet the specific needs of all students and their instructors. As empiricists, we should be willing to experiment. If what we’re doing isn’t working, we should try other things. Ultimately, our feedback and the feedback from our students can help producers of content to develop even better materials. Laura Freberg is a Professor of Psychology at California Polytechnic State University, San Luis Obispo, and adjunct instructor for Argosy University Online. Dr. Freberg received her bachelors, masters, and Ph.D. from UCLA and conducted her dissertation research with Robert Rescorla of Yale University. She is serving as the 2018-2019 President of the Western Psychological Association. Writing abilities are among the most important skills for psychology students to develop for work in the “real world” after college, regardless of the area of higher education or employment they pursue. Writing effectively is necessary for tasks ranging from communicating with collaborators on a project to generating proposals to convince others to invest time or money behind a plan, as well as for everyday situations in which writing with finesse and efficiency are essential. In addition, writing can be a method for students to perform higher-order thinking, using writing as a tool to help put varied thoughts into a logical sequence, organized discretely around a focus or in the service of a broader goal. For the purpose of helping professors in their implementation of writing in coursework, Kaitlin Mondello and I recently gave a presentation at the GSTA’s 2018 Pedagogy Day event on how we teach writing skills to students and teach content to students by way of these writing skills. Our workshop was based in the Writing Across the Curriculum (WAC) movement, which addresses the importance of writing’s place in any and all academic disciplines, and has developed over decades (see Northern Illinois University’s A Short History of WAC page for more information about the history of this movement). WAC has yielded various approaches to implementation of writing in the classroom may be utilized for achieving the aforementioned purpose. This current blog post, following generally the structure of the workshop Kaitlin and I gave, will cover a few central ideas of WAC. These will be advanced roughly in the sequence of, initial planning of writing → construction of writing assignments → use of rubrics for showing which competencies an assignment taps → how to leave effective feedback on students’ papers. Start with your personal course objectives: What is it you want your students to get out of the course? Do you want them to remember a lot of theory or research findings? Apply psychological ideas to the real world? Attain a more general critical/questioning lens? By identifying what your learning goals for the students are, you will be better able to construct writing assignments that help your students to achieve those goals. See the American Society for Microbiology’s page Starting at the End: Using Backward Course Design to Organize Your Teaching for more information about this approach. Ensure you are constructing writing assignments all from a ‘writing to learn’ standpoint – this is not elementary school, where children are largely ‘learning to write.’ This is also not high school, where students are mainly already writers, but are often engaged in more rote or other low- to mid-cognitive engagement writing tasks (e.g., summarization, regurgitation of facts). This is college, where the writing in which pupils are most importantly engaged revolves around constructing knowledge (i.e., taking course content and giving their own analyses or making connections utilizing the content). Your own existing assignments that may not fully meet this criterion may be modifiable to attain these characteristics. For example, perhaps the assignment you already have asking students to summarize Bandura’s Social Cognitive Theory and its key elements could be modified to have students analyze a situation (either from their own experiences or one you provide to them) through the lens of the theory. This adjustment to the assignment would cause them to put their own signature on the paper and thereby ingrain it more firmly in their own memory. Utilize both low-stakes and high-stakes assignments. Low-stakes assignments are small and low-grade impacting (e.g., 3–5 minutes of freewriting in response to a question), while high-stakes assignments are large, formal and high-grade impacting (e.g., a 4–6 page paper organized into paragraphs including APA style references). Effective use of these in tandem can help more of your students achieve execution of higher-order thinking on important topics by writing well-organized in-depth papers (i.e., in high-stakes papers), built up to by their having been provided lower-level scaffolding to help them work towards those higher goals (i.e., in low-stakes assignments; e.g., by trying out possible paper topics, or practicing how to cite relevant information from a journal article). 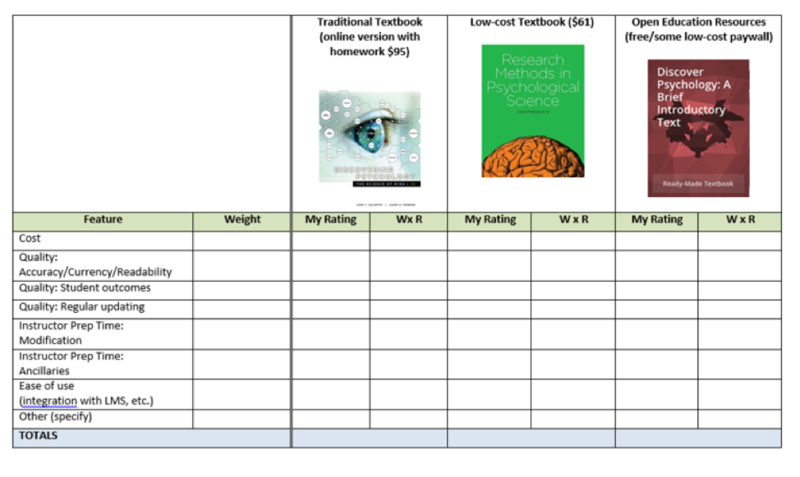 Use what Bean (2011) calls a task-specific, analytic rubric. The task-specific guideline recommends use of one rubric per assignment rather than one rubric for all assignments. Rubrics that highlight the assignment-specific elements make grading and feedback clearer for students. The analytic guideline recommends using a rubric with different sub-grades for each competency rather than a rubric that combines all competencies into a global evaluation or grade. See Figure 1 for an example of a task-specific, analytic rubric. In using an analytic rubric, keep the number of competency categories to 3–6. Fewer than 3 categories gives the student too little detail on the breakdown of their grade, and more than 6 can be over-encumbering to both you who have to grade the student in all those categories and the student who has to interpret such a complex breakdown. All in all, WAC’s approach to feedback helps us realize that feedback is not most crucial for justifying a grade – it is most crucial for helping students continue to develop their skills in the field. After all, did we become college instructors to only make sure students know why their grades were as far below an A as they were, or to provide students with manageable next steps they can take and inspire them to reach for those stars? Through the use of these foundational elements of WAC applied with psychology instruction in mind, you may find substantial changes in your experience of teaching and the work you receive from students. These may be achieved with only a few easy-to-implement (but of great significance) adjustments to your use of writing in teaching. In fact, I hope I will experience these enrichments in the future as an instructor as well, as my semesters of teaching college thus far have all been before my induction as a WAC Fellow at Queensborough Community College. I am excited for my return to the classroom and possibly realizing the benefits I have seen happen for professors who are taught to incorporate the main WAC principles into their classrooms. In the end, we all recognize the importance of writing in college teaching from the outset, so why not make it a personal goal to improve the way writing is implemented in our courses to the greatest degree possible? Bean, J. C. (2011). Engaging ideas: The professor's guide to integrating writing, critical thinking, and active learning in the classroom. San Francisco, CA: Jossey-Bass. Acknowledgments: A big thank you to Dr. Kaitlin Mondello, who as mentioned in this post I had the pleasure of presenting on WAC with recently at the GSTA’s 2018 Pedagogy Day event; the Writing Intensive Training Program at Queensborough Community College, where I have had the opportunity to perform the bulk of my training and work in WAC; and Dr. John Bean, whose great ideas I take from routinely through his book cited here. Charles Raffaele is a doctoral student in the Learning, Development, and Instruction specialization in Educational Psychology at The Graduate Center, The City University of New York. His research focuses on theoretical domains of second language acquisition, the use of multimedia and games in learning, and intersections between these. He is an editor of the GSTA Blog, webmaster for DE-CRUIT and the AERA SIG Studying and Self-Regulated Learning, and a member of the Child Interactive Learning and Development (CHILD) Lab. Many students appear to struggle with writing tasks in college for at least several reasons. In college, there is typically a higher demand for high-quality writing across many college-level courses and disciplines (Oppenheimer, Zaromb, Pomerantz, Williams, & Park, 2017). In addition, for a student who is unfamiliar with a topic, writing may be particularly straining on attention and memory capacities (Kellogg, 2001; Kellogg, Olive, & Piolat, 2007). Although practice, along with adequate feedback, is considered essential for improving one’s writing (Graham & Perin, 2007), there may be few opportunities for college students to practice writing not tied to their grades. From the instructor’s perspective, however, managing time necessary to provide adequate feedback to students on written work through detailed commentary on their initial drafts is not always feasible. In light of these challenges, Manuscript Builder was designed to provide structure through a set of ordered prompts to support students' writing. In the latest iteration of the tool, it now also provides a platform for conducting peer reviews. Prior studies have shown that student-led peer review can be effective at improving students’ writing skills (Topping, 1998; Van Zundert, Sluijsmans, & Van Merriënboer, 2010), tends to be valid and reliable assessment of student work (Cho, Schunn, & Wilson, 2006), and is viewed both as motivational and meaningful by students (Hanrahan & Isaacs, 2001). Student-led peer review is also effective when conducted through a computer-mediated format (Cho & Schunn, 2007). Student-led peer review can be conducted through an online tool available to instructors and students. 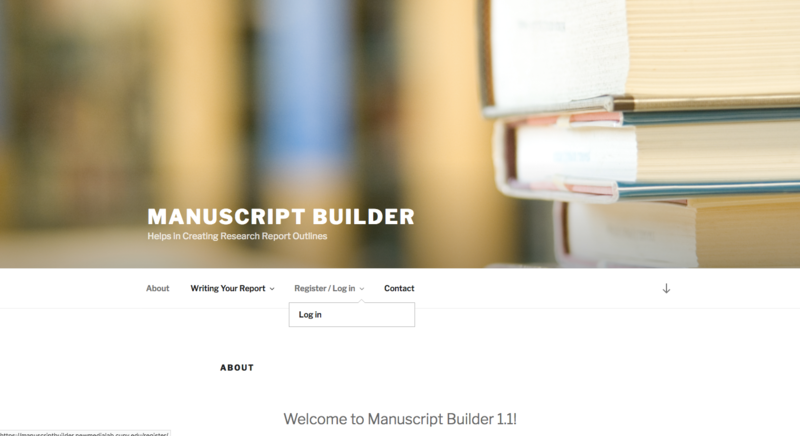 As a pedagogical tool, Manuscript Builder is designed to facilitate the planning and outlining process by providing a purpose, a text structure, and prompts to guide students in drafting a written research report. The user can navigate between pages, with most representing a specific section that would appear in the final written report (e.g., Introduction, Methods, Results and Data Analysis, Discussion, References). Each page contains a set of prompts and an input text field. 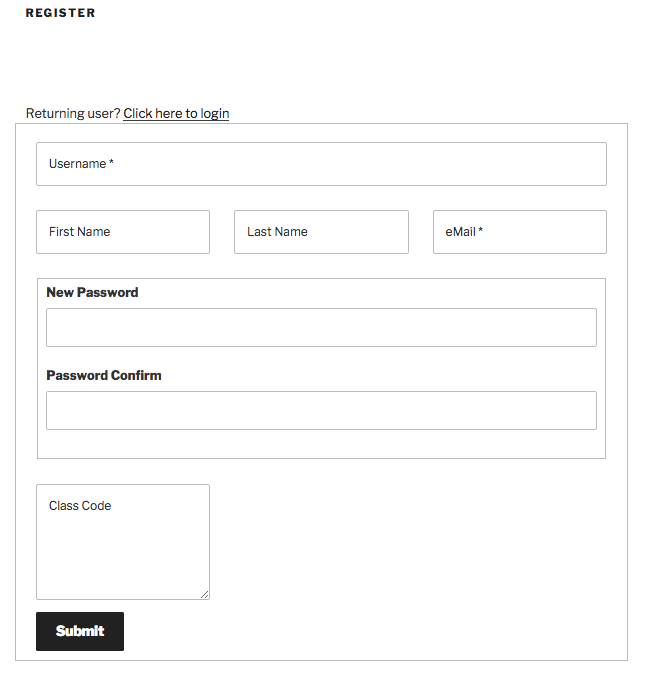 Users can create an account on the site and return to previously drafted work by logging-in at any time. 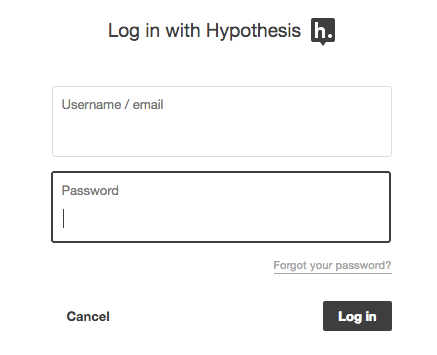 When users have finished writing responses to prompts, they can copy their responses and share as a finalized post. The finalized post can then be used for further writing, editing, student-led peer review, and finally, publishing on the site. The steps below outline the process for adding a manuscript and conducting a peer review. Instruction around writing, and communication more generally, remains an essential component of the undergraduate curriculum, regardless of students’ majors. Direct writing instruction for undergraduate students has benefits for learning (Graham & Perin, 2007). It also stands as a core goal of the APA Guidelines for the Undergraduate Major, version 2.0 (APA, 2016). By leveraging peer-feedback, Manuscript Builder helps to facilitate student-led peer-review processes, which may be one effective means by which to provide students an engaging and collaborative activity to promote their writing skills. 1) Log-in to your computer and open a web-browser. 3) Enter your first and last name, the class code your instructor gave you, a username, your email, and a password that you will remember. 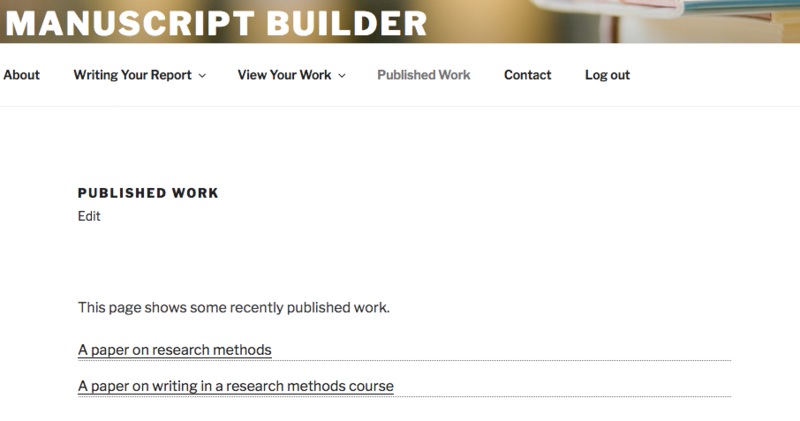 1) Once you are logged-in, go to the “Publish Your Work” page (URL: https://manuscriptbuilder.newImedialab.cuny.edu/post-form-page/). 2) Add the title for your report and copy-and-paste the main body of your report. 3) When you are ready, just click the button at the bottom of the page. 4) You can always return to your drafts by going to the “View Your Work” page (URL: https://manuscriptbuilder.newmedialab.cuny.edu/view/). On this page you can choose to continue editing your draft or delete it entirely. 1) Go to the “Published Work” page (URL: https://manuscriptbuilder.newmedialab.cuny.edu/published/). 2) There you should see a list of published reports. 4) After you are redirected to that page, you should see a side-bar open up on the right side like this image below. 6) Once logged in, you can begin commenting on your peer’s work! Cho, K., & Schunn, C. D. (2007). Scaffolded writing and rewriting in the discipline: A web-based reciprocal peer review system. Computers & Education, 48(3), 409–426. Graham, S., & Perin, D. (2007). A meta-analysis of writing instruction for adolescent students. Journal of Educational Psychology, 99(3), 445–476. Hanrahan, S. J., & Isaacs, G. (2001). Assessing self-and peer-assessment: The students' views. Higher Education Research & Development, 20(1), 53–70. Kellogg, R. T. (2001). Competition for working memory among writing processes. The American Journal of Psychology, 114(2), 175–191. Kellogg, R. T., Olive, T., & Piolat, A. (2007). Verbal, visual, and spatial working memory in written language production. Acta Psychologica, 124(3), 382–397. Oppenheimer, D., Zaromb, F., Pomerantz, J. R., Williams, J. C., & Park, Y. S. (2017). Improvement of writing skills during college: A multi-year cross-sectional and longitudinal study of undergraduate writing performance. Assessing Writing, 32, 12–27. Topping, K. (1998). Peer assessment between students in colleges and universities. Review of Educational Research, 68(3), 249–276. Van Zundert, M., Sluijsmans, D., & Van Merriënboer, J. (2010). Effective peer assessment processes: Research findings and future directions. Learning and Instruction, 20(4), 270–279. In teaching Introductory Psychology, we aim to infuse a healthy dose of research methods into our lesson plans for each course topic. A key point that we emphasize throughout the semester is that all research starts with a question: What do we want to find out? Then, researchers select methods that are appropriate to address their question. For our unit on personality, we pose the broad question: How does personality impact social media use? After posing the question, we demonstrate how to use Google Scholar to find existing research on the topic. Most of our students have never heard of Google Scholar and have limited, if any, experience reading journal article abstracts. As Part 1 of the activity, we identify possible keywords to use as search terms, such as personality and social media. Figure 1 below shows the results of our Google Scholar search as well as links to access some of the articles via our campus library. The next step is to open up the links to view abstracts of relevant articles. When reading abstracts, we teach students to look for five key pieces of information: the rationale for the study, the research question, the results, the conclusion, and the implications. For example, the abstract for the first article, Who interacts on the Web: The intersection of users’ personality and social media use (Correa, Hinsley, & De Zuniga, 2010), summarizes a study identifying links between Big Five personality traits (i.e., openness, conscientiousness, extraversion, agreeableness, and neuroticism) and social media use. As a class exercise, we have students search for the five key pieces of information from one or more abstracts and paraphrase the findings in their own words. This semester, our students completed the paraphrasing exercise as a homework assignment, but it can also be implemented in class followed by discussion. Part 2 of the activity involves generating our own dataset, which allows us to compare results from our class with the findings reported in the published articles. Here, we start by administering a short-form assessment of the Big Five Inventory (Lang, John, Lüdtke, Schupp, & Wagner, 2011). This assessment is a structured personality test consisting of three Likert-scale items for each of the Big Five traits. Items include, e.g., I see myself as someone who is outgoing, sociable. Students are instructed on how to score the assessment, including how to factor in responses on reverse-scored items. Next, we ask students to take out their smartphones, check the number of Facebook friends that they have, and write the number on their Big Five worksheets (for students who are not on Facebook, we have “missing” data that can prompt discussions on how to operationalize variables such as social media use). At the end of the class period, we collect the results, emphasizing to the students that they should provide us with anonymous data. 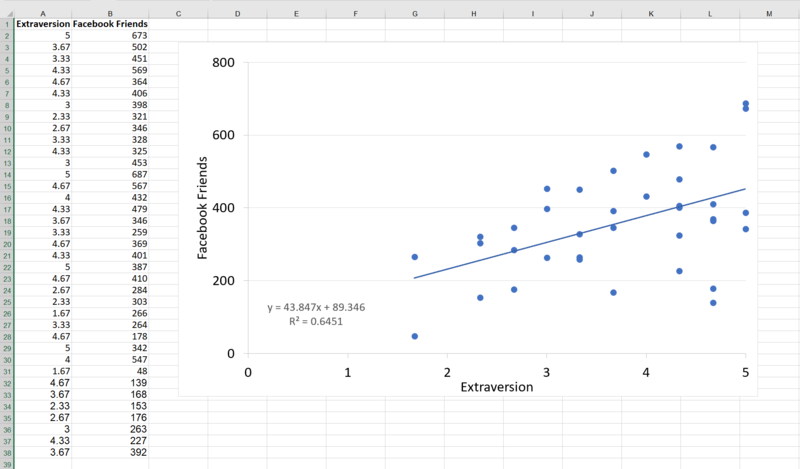 After tabulating the data in Excel, we create scatterplots in the next class to display results relating each personality factor to the number of Facebook friends (see Figure 2 for an example). Figure 2. Screenshot of the class data and scatterplot relating extraversion and number of Facebook friends. We demonstrate how to generate a best fit line to make clearer observations by clicking on “Chart Elements,” then “Trendline,” and lastly “Linear.” Double clicking on the trendline lets us add additional options, such as a linear equation and R-squared value. As we generate the scatterplots, we ask students to interpret them in relation to our research question—How does personality impact social media use?—while emphasizing that correlation does not imply causation. 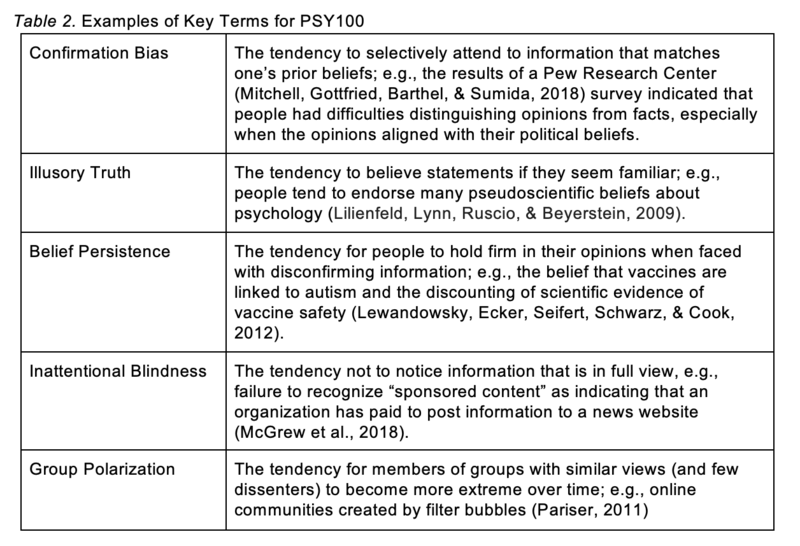 Using terminology such as positive, negative, and zero correlation, we evaluate the evidence linking specific personality factors with the number of Facebook friends. Finally, we ask students to compare the class results with findings from the previously reviewed articles. Further discussion may center on confounds, replicability, and issues of validity. Introducing data collection in Introductory Psychology courses provides students with opportunities to develop quantitative thinking and research skills. Such skills include using databases to locate relevant prior research on a topic, reading scientific abstracts and paraphrasing information, generating graphs and statistics using spreadsheet software, and interpreting data. Correa, T., Hinsley, A. W., & De Zuniga, H. G. (2010). Who interacts on the Web? 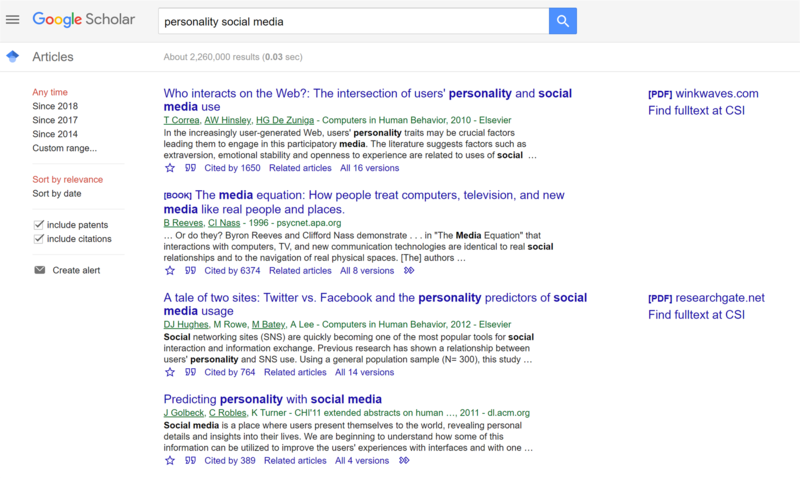 : The intersection of users’ personality and social media use. Computers in Human Behavior, 26(2), 247–253. Lang, F. R., John, D., Lüdtke, O., Schupp, J., & Wagner, G. G. (2011). Short assessment of the Big Five: Robust across survey methods except telephone interviewing. Behavior Research Methods, 43(2), 548–567. Patricia J. Brooks is Professor of Psychology at the College of Staten Island and the Graduate Center, CUNY and GSTA Faculty Advisor. Brooks was recipient of the 2016 President’s Dolphin Award for Outstanding Teaching at the College of Staten Island, CUNY. Her research interests are in two broad areas: (1) individual differences in language learning, (2) development of effective pedagogy to support diverse learners.